The McEachern Lady Indians are on break. At 7-1 with region games ahead of a New York classic coming in January, McEachern is settling into their season. Their lone loss came at the hands of No.3 ranked nationally Blackman (TN) by seven in a Tennessee tournament. McEachern (7-1; 4-0) swept Ribault-Jacksonville (FL) and Edgewater (FL) in a Florida tournament and have since remained undefeated in region action with a thirty point victory over region neighbor Harrison. For a team that likes to use pressure defense and push the tempo the Lady Indians are only averaging 64.6 points per game. Defensively they are allowing 49.0 points per game, averaging 17.43 in margin of victory in seven wins. Junior Te’a Cooper is putting up numbers to the tune of 16.5 pts 5.6 ast 3.7 stl, Taylor Gordon is second in scoring in the team at 15.3 pts and Caliya Robinson is putting up 11.3 pts with 8.8 reb. McEachern is no longer ranked nationally after starting 20th in the preseason. 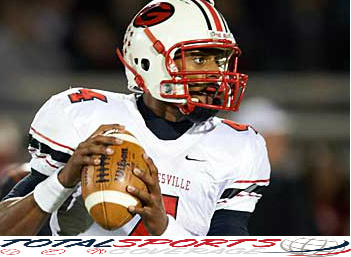 Southwest Dekalb (GA) (7-2) is ranked at No. 20 nationally by Max Preps defeating Southwest Atlanta Christian (GA), Miller Grove (GA) and Sacramento (CA). Southwest’s losses have come to Tucker (GA) and Windward (CA). Tucker loss to Norcross in a scrimmage, McEachern defeated Norcross on the road by two points this regular season. No other Georgia teams are nationally ranked. McEachern’s next five games are against region opponents Kennesaw Mountain, Pebblebrook, Campbell, North Cobb and Marietta. They have defeated North Cobb and Marietta already this season. After that, Nazareth (NY) and Capitol Christian Academy (MD) await in New York for the Rose Classic Super Jam. The Horsemen, formerly known as the Henry County Horsemen, will field a football during the 2014 minor league football season. The Horsemen have won minor league championships in its history and most recently advanced to the 2011 Gridiron Developmental Football League semifinals, losing to the Chambersburg Cardinals, the eventual 2011 champions. Neither the Horsemen or Cardinals fielded a team in 2013. The Horsemen have won league championships in the USFL along with playing in and having success in minor league football bowl games. Their most recent run of success was in 2011. 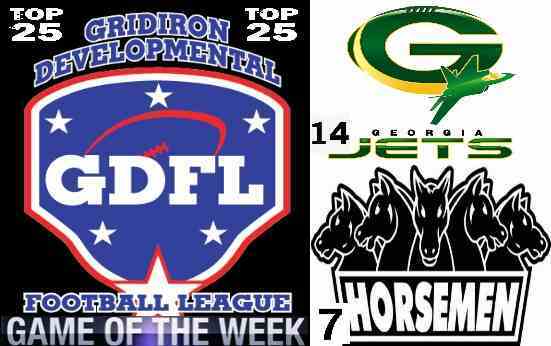 Playing in the GDFL, the Horsemen made a semifinal run knocking off nationally ranked playoff opponents the Georgia Jets, Atlanta Chiefs and Georgia Crush during the season. They had one of the league’s top defenses with a multiple quarterback offense-featuring a power running game and quality receivers. Horsemen have fielded a Top 25 team in recent years. They went as deep as the semifinals in 2011. Georgia’s 2013 High School Football season completed in the early morning hours this past Sunday Dec. 15th. When the final fourth quarter horn sounded at 12:21 A.M. the Norcross Blue Devils (13-2) repeated as Class 6A champions. They scored 31 unanswered points to defeat North Gwinnett (13-2) 31-14. Myles Autry returned a kickoff 92 yards for a touchdown, caught a 69-yard touchdown pass and finished with 203 all-purpose yards for the state champions. Quarterback AJ Bush passed for 303 yards tossing two touchdowns on beautifully thrown balls and scored on the ground. “Basically that kickoff return for a touchdown turned the game around for us. We were scrambling there on offense for a little bit and that turned the corner for us a little bit, the defense got feed off it and we just got better and better overall,” Norcross head coach Keith Maloof said. Norcross held North Gwinnett to their lowest scoring game this season and intercepted Hayden Spire four times. Jaquan Fraizer led Norcross in tackles with 11 plus a pick. Ridwan Issahakua-a second year transfer from woeful Meadowcreek, snagged two interceptions after being beaten for touchdowns by Nate Brown and Caleb Scott earlier. Norcross is 28-2 the past two seasons with two state championships and shared this seasons region 7-6A crown with North Gwinnett and Collins Hill. Collins Hill was eliminated in the quarterfinals. In a three-way coin flip for playoff seeding it was Norcross, Collins Hill and North Gwinnett in that order. North Gwinnett, having to play on the road, became the first team in Georgia’s highest class to win four consecutive road playoffs games to make the state finals. Creekside (15-0) is not ranked in the compilation poll either. The Seminoles are No. 24 in the NationalHSFootball.com HSFB100. North Gwinnett, Griffin, Colquitt County and Buford are in the top 50 of the HSFB100. 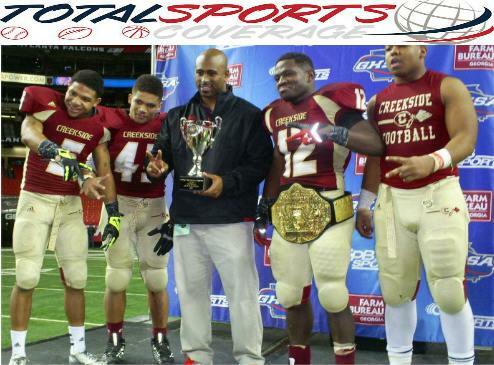 The season began with heartache for the Creekside Seminoles with the sudden loss of De’Antre Turman during the season opening scrimmage game, it ended with tears of joy and thoughts of their fallen teammate as they hoisted the 2013 Georgia Class 5A championship trophy. “When I first took this job I thought it was a diamond in the rough. I thought all the talent and pieces were there and we just had to cultivate it, instill some discipline and the kids bought into everything I was preaching to them from day one and I’m just so excited to finally get this thing done,” Creekside head coach Olten Downs said. Creekside (15-0) ranked No.64 nationally, put that talent and pieces together to defeat nationally ranked No. 43 Tucker (14-1) 52-28 to win their first-ever state championship becoming the first school from South Fulton county to win a state title since 1983 (Palmetto). The ‘Noles broke open a tie game after halftime on the opening kick off when Cameron Johnson returned it 99 yards for a touchdown for their first lead at 21-14 and they would never relinquish it. Jackson led Creekside with eight tackles. Tucker’s Elijah Sullivan fumbled on the next possession and two plays later Creekside found the end zone again on a 16-yard Dexter Neal run to put the Seminoles up 28-14. Tucker would hang tough but it was all Creekside the rest of the night. Creekside outscored Tucker 24-14 in the third quarter, 38-14 in the second half. “We’ve been a great second half team all year-long and we knew coming into the game it was going to be about adjustments and making the fewest amount of mistakes,” Creekside head coach Olten Downs said. Downs is in his first year after coming over from Riverdale and won a state title as a player in 2000 at Shaw (GA). Running back Dexter Neal stole the show rushing for 164 yards and 5 touchdowns. Neal wasn’t alone as backfield counterpart Bricen Terry rushed for 144 yards as Creekside racked up 326 yards rushing against a vaunted Tucker defense. “It’s truly a blessing that all my teammates could come together and we could do this on one accord and for one fight and one cause,” Neal said about winning the state title. What about those five touchdowns Mr. Neal? “I owe it all to my offensive line, I really shouldn’t be getting this credit, it’s my offensive line and my other back ‘BT’ (Bricen Terry), he was wearing them down with me. I just owe it to the whole team because everybody was behind me and we all fought together,” Neal added. Felix Harper hit Jayson Stanley for a 77-yard touchdown pass for Creekside’s only passing score of the day. The sophomore quarterback finished 8-14 209 yards 1TD 1INT on the day. Harper didn’t show his age yet showed poise in guiding Creekside to their first two touchdowns leading the ‘Noles 80 yards in 15 plays and 96 yards in 8 plays answering Tucker touchdowns. “The upside for [Felix] Harper is that he’s just a baby and he can only go up from this point. We’ve been tough on him as coaches to get it done and he’s responded very well and were proud of him,” Downs said about his starting quarterback. Creekside held Tucker without a 100-yard rusher as quarterback Joseph Farrar lead the Tigers with 90 yards and a touchdown as Tucker put up only 158 yards on the ground. Farrar was 7-18 178 yards and two touchdown through the air. Dominick Sanders caught two touchdowns while Yaquis ‘Duke” Shelley added a rushing touchdown for Tucker. “It’s big, anything less than this is unacceptable, were just setting the standard for Creekside football and we want to be a power in the state of Georgia and that’s where were headed,” Downs responded when asked about bringing home the first state title in Creekside history. Creekside’s inspired play carried them to a championship and what a great way to end the story of the 2013 Creekside Seminoles. Tucker won the last and only previous meeting between the teams in the 1998 playoffs. Tucker is going for its third state title while Creekside is seeking its first. The Griffin Bears (14-0) got off to a slow start against Wayne County a week removed from eliminating top-ranked Sandy Creek. The Bears recovered to rally past Wayne County 25-20 to earn their spot in the class 4A championship. Trailing 14-6 at the half, Griffin scored 19 unanswered points to take a 25-14 lead. Jaquez Parks rushed for a touchdown and passed for a touchdown while Anforne Stroud returned an interception for a touchdown for the Bears. Griffin won their 14th game in a season for the first time since 1980 when they went 14-1. The Bears are averaging 33.25ppg while allowing 13.25ppga with a shutout in the playoffs. Carrollton and Marist love overtimes. Marist outlasted Carrollton last season in five overtimes to advance in the playoffs. This season the teams played four overtimes with Carrollton stopping a Marist two-point conversion to advance 46-44. Jarvis Terrell had three rushing touchdowns, quarterback Will Garrett rushed for two touchdowns and DeAntonie Cammons returned an interception for a touchdown for the Trojans. Terrell scored from six yards out and converted the two-point conversion in the fourth overtime forcing Marist to get a score and successful two-point play if they wanted to extend the game, Chase Martenson was stopped short on the two-point attempt. Martensen rushed for two touchdowns and passed for another and Marcus Miller rushed for a touchdown and passed for a touchdown for the War Eagles. Carrollton (13-1) will be going for their eighth state championship and first since 1998 when they take on Griffin in the finals. The Trojans and Bears will be meeting for the first time in modern history. 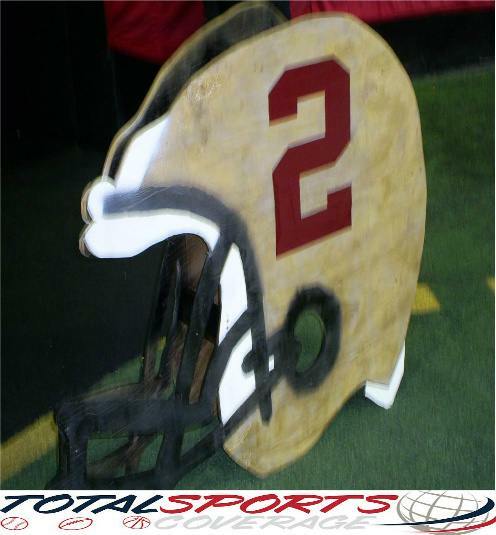 The Creekside Seminoles will be making their first trip to the Georgia Dome with a shot at bringing home their first-ever state title. Creekside easily handled Kell 55-10 in the semifinals to advance improving to 14-0 under first-year head coach Olten Downs who came over from Riverdale this season. Kell led 3-0 after their first drive in the opening quarter and from there it was all Creekside after they exploded for 21 points in the second quarter. Running backs Dexter Knox and Bricen Terry rushed for three touchdowns each while Elliot Berry and Julian Gibbs added rushing touchdowns. Creekside rushed for over 430 yards in the win. Kell’s only touchdown came on a 67-yard pass from Matthew McGuigan to Julian Burris. Kell entered the game averaging nearly 400ypg, finished with just over 300 yards of total offense against Creekside. In the postseason the Seminoles are averaging 46.2ppg and allowing 14.75ppga. They’ve scored 40 or more points in their last six games and have not given up more that 21 in a game during that span. Creekside is playing inspired football with the loss of teammate DeAntre Turman who died from injuries sustained in their season opening scrimmage. They’ve dedicated this season to him. Dr. Patrick Kerr has since donated his Kerr Collar, a neck protection device, to Creekside and they have been wearing it as a team since the final week of the regular season. They are the only football team currently in the nation with their entire team equipped with the Kerr Collar. The Tucker Tigers scored 20 unanswered points after trailing 14-0 to eliminate Gainesville 20-14. Deshaun Watson rushed for a touchdown and passed for a touchdown giving the Red Elephants a 14-0 lead in the second quarter. Tucker’s Joe Farrar hit Detrick Dukes on a 9-yard touchdown pass to make it 14-7 and that held until halftime. Farrar would throw his second touchdown pass in the third quarter hitting Dominick Sanders from 33 yards out to even the game at 14. Tucker (14-0) put together their game winning drive late in the fourth quarter using 11 rushing plays to go 53 yards capped by a 6-yard Dominick Sanders touchdown run. The extra point failed but Tucker led 20-14 and held on for the win. Watson, Georgia’s all-time passing leader, finished with 185 yards passing falling 213 yards short of becoming the first Georgia player with two 4,000 yard seasons. Tucker and Creekside enter the 5A title game with a combined 28-0 record with Tucker averages 41.7ppg this season but only 25.0ppg in the postseason. Creekside leads the all-time series 1-0 with a 27-22 victory in the second round of the playoffs in 1998. Tucker will be going for their third state title in six years and first since 2011. Bryan Lamar is in his second season as head coach of the Tigers with a 24-3 record entering the title game. 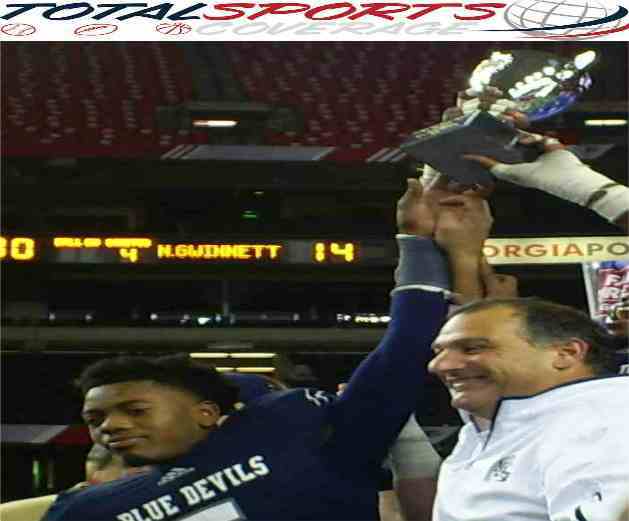 The Norcross Blue Devils opened their defense of the 2012 Georgia 6A title with a disgraceful 55-0 loss on national TV at the hands of the nations No.1 team Booker T. Washington (FL). Booker T. Washington is still ranked No.1 and are undefeated through a nationally laden schedule with Florida powers included. The Tornadoes are playing in the 4A Flordia state Finals (Florida has 8 Classes) and are in the driver’s seat for the “National Title”. Norcross suffered their second loss in three games to the North Gwinnett Bulldogs 36-17 after leading at halftime. Since the 1-2 start Norcross has ripped off 11 consecutive wins. The Blue Devils get their shot at North Gwinnett and redeeming their national respect again in the Georgia 6A state finals. Georgia has 15 teams that have seen the national ranked at some point this season and will have at least ten finish nationally ranked due to the overall strength of Georgia. Norcross is adding to that strength despite taking one of the worst losses in Georgia vs Out-Of-State games in recent years (since 2007) and are making their second consecutive trip to the finals in the Georgia finals. Previously Norcross has never advanced beyond the quarterfinals prior to last year in the schools history. Norcross defeated Colquitt County 14-9 in the semifinals to advance. Colquitt County is the first team to reach the semifinals five consecutive years Georgia history in the highest classification yet are 1-4 in those games. Norcross’ Myles Autry had been quiet most of the season coming off a knee injury sustained in the playoffs last season. Trailing 9-7 Autry took a screen pass, darted then juked free to the end zone for what would wind up being the game-winning touchdown in the fourth quarter. It was Autry’s second touchdown of the season. Norcross led 14-9 after Autry’s heroics and held on for the win. Jordan “Speedy” Noil intercepted a pass and returned it 44 yards to seal Norcross’ victory in the final moments. Colquitt County led 6-0 after a pair of Jose Vega field goals. Colquitt would lead at the half after Vega hit another field goal answering a James Keeling one-yard touchdown for Norcross. Norcross’ quarterback A.J. Bush set up the score with a 52-yard run. Colquitt held their 9-7 lead into the fourth quarter with 10:18 remaining when play was suspend due to lightning. Other games west of Norcross had been suspended earlier as storm cells entered Georgia from the northwest and moved east. After the delay Autry entered his own form of lightning to carry Norcross to the state finals. North Gwinnett turned the ball over three times in the first half yet took a 14-7 lead to the locker room at halftime. The Bulldogs and the Indians would experience an almost 90-minute halftime as the game was suspended during halftime due to lightning. McEachern turned an early turnover from North Gwinnett into points when senior starting quarterback Ty Clemons hit T.J. Rahming on a 26-yard touchdown for a 7-0 lead 19 seconds into the game. North Gwinnett answered right back with a C.J. Leggett 3-yard touchdown run to even the score at 7. Leggett rushed for nearly 300 yards in the game and has nearly 800 yards rushing with nine touchdowns in the postseason. After the lengthy halftime, McEachern knotted the score at 14 on a Bailey Hockman touchdown pass to Trey Scott from 38 yards out. C.J. Leggett raced in from 50+ yards for another touchdown giving the road-weary but road-warrior Bulldogs a 21-14 lead. Michael D’Angola would add two more field goals, he missed early in the fourth quarter, for a 27-14 with under four minutes remaining. McEachern quickly put together a 4-play 60-odd yard drive to pull within six at 27-21. McEachern capped the drive on a 7-yard touchdown pass from Hockman to Artise Clark for the final margin as the point off D’Angola’s leg proved to be enough. It was the second game D’Angila has won with his leg as North Gwinnett skated by Archer 34-32 on an A’Angola field goal in the closing moments. North Gwinnett became the first team to win four road playoff games to advance to the state finals nd are in the finals for the first time since 2007 (all under Head Coach Bob Sphire). Charlton County is in 1A Public won three road games to advance to the state finals. 1A Public plays one less round that 6A in Georgia. The middle classes in the Georgia semifinals provide quality match-ups with Class 3A still having a nationally ranked team. Class 4A’s favorite and lone nationally ranked team was eliminated meaning there will be a new champion in this class. Here is a look at how both classes semifinalist got there and what they have done to this point in the season. In 4A Griffin is the lone unbeaten team and defeated previously unbeaten and class favorite Sandy Creek (11-1-1). Sandy Creek’s only other non-win this season came to Plant (FL). Plant and Sandy Creek tied in the season opener in August and Plant will face Apopka in the Florida Class 8A semifinals. Carrollton, which lost to Sandy Creek in the regular season, defeated Oxford (AL) during the regular season. Oxford was eliminated in the second round of the Alabama 6A playoffs. Griffin remained undefeated knocking off Sandy Creek 32-26. Turnovers were the story of this game but the Bears came out on top. Jordan Colbert broke the seal on scoring with an 80-yard interception return for a touchdown. Sandy Creek’s Eric Swinney rushed for two touchdowns, Cole Garvin hit Justin Sumpter on a touchdown pass and Lorenzo Broadwater added two field goals for Sandy Creek. In the end it was Griffin and Jacquez Parks. Parks led Griffin on two late touchdown drives in the fourth quarter as Griffin advanced to play Wayne County in the semifinals. Parks hit Christian Owens on a touchdown pass and Telly Sloan scored the go-ahead touchdown on the ground for the Bears. Griffin will host Wayne County in the semifinals. Prior to the Sandy Creek victory, Griffin’s previous biggest win was against Stockbridge (lost in the quarterfinals to Carrollton). Marist racked up nearly 430 yards rushing ending Burke County’s 11 game home playoff winning streak with the 42-20 victory. Chase Martenson rushed for four touchdowns and Marcus Miller rushed for two touchdowns for Marist. Donquell Green rushed for a touchdown and passed for a touchdown for Burke County in his final game. Marist will host Carrollton in a playoff rematch from last season. Marist losses this season came to 5A Thomas County Central- eliminated in the first round and 2A semifinalist Lovett. Carrollton won the battle of the Wing-T offenses scoring 17 unanswered points in the second half to defeat Stockbridge 24-14. Will Garrett, Trey Chivers and Jarvis Terrell rushed for touchdowns and Tyler Newsome kicked a field goal for Carrollton. Carrollton finished with 0 yards passing. Javon Brandon rushed for a touchdown and passed for a touchdown for Stockbridge. Carrollton will face Marist in the semifinals. Marist defeated Carrollton in five overtimes in the second round of the playoffs last season. Carrollton’s only loss this season was to Sandy Creek. Wayne County exploded for 51 points, two shy of their season high, on the strength of Krenwick Sanders three touchdown receptions and a rushing touchdown. Lavontae Larry returned and interception for a touchdown while Anfreenee Jordan and A.J. McGill added rushing touchdowns in the 51-21 victory over Alexander. Wayne County will travel to Griffin in the semifinals. Both of Wayne County’s losses came to 4A Burke County (eliminated in the quarterfinals by Marist). In 3A Buford and Washington County are the only undefeated teams. Buford is the defending champion. Callaway (12-1) defeated St. Pius 35-14 and is quietly becoming a team that many my need to take notice in despite Buford’s “lock” on 3A. Tez Parks rushed for two touchdowns, Terry Godwin and Eddie Culpepper added a rushing touchdowns and Dre Martin returned an interception for a touchdown for Callaway. Joey Conners and Nick Ruffin had touchdown runs for St. Pius. Callaway will travel to Buford for the semifinals. Callaway’s loss came to 5A Harris County who lost in the second round of the playoffs to undefeated Creekside. Buford was able to shake off their slow start to defeat Carver-Columbus 36-6 to advance. Taylor Mitchell, Evan Cooper and Thomas Wilson had rushing touchdowns and Mitchell tossed a touchdown to Tyler Shipman for Buford. Jawon Pass rushed for Carver-Columbus’ only touchdown. Buford won the coin toss and will host Callaway in the semifinals. Hosting the semifinals means Buford will not play a road game in the playoffs as the championship game will be held in the Georgia Dome if they advance past Callaway. Buford has scored 36 or more points in every game this season and has not allowed more than 14 points in a game this season winning every game by 24 or more points. The Wolves defeated 5A Gainesville during the regular season and have scored 60 or more points in four games this season. Melvin Hill rushed for five touchdown and DJ Sanders had four interceptions as Washington County defeated Blessed Trinity 46-17. Washington County defeated four playoff teams during the regular season, 1A Public ECI (lost to Johnson County in the first round) , 2A Lovett (semifinalist) in overtime, 3A Laney (lost to Lovett in the quarterfinals) and 3A Jefferson County (lost to Carver-Columbus in the second round). Washington County was leading in their season opener against 1A Private semifinalist ECLA before it was suspended due to lightning. Since the contest was a non-region game it did not have to be completed nor made up therefore it did not count towards either teams record. Ringgold defeated Central-Carrollton 35-10. Ringgold quarterback Slade Dale scored at least two touchdowns and Wesley Long had Central-Carrollton’s only touchdown. Ringgold defeated 4A Dalton (lost in the first round of the playoffs) and lost to playoff teams Central-Carrollton and Carterville during the regular season. They have wins over North Hall and Cedar Grove in the playoffs.